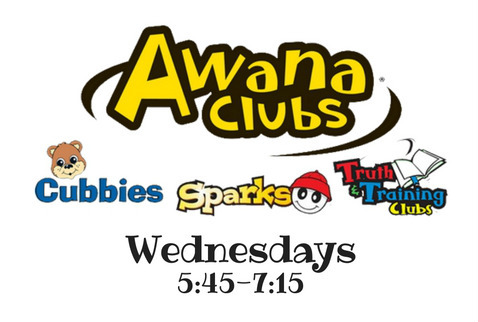 AWANA CLUBS for 3yrs-6th grade, Wednesday Nights During the School Year, 5:45-7:15 PM. Register here. Do you have questions or would you like to volunteer? Cubbies (3 and 4 year olds) is fun with a purpose - to reach and train kids for Jesus Christ. Games, puppets, crafts, awards and other activities transform our preschool program into a lively weekly experience where fun and learning go hand in hand. Sparks (Kindergarten through 2nd grade) builds on the material taught in our preschool club. The curriculum takes kids a step deeper into God's Word while giving unsaved boys and girls regular opportunities to hear the gospel and come to faith in Jesus Christ. After being immersed in solid foundational teaching at the preschool level, boys and girls frequently come to an understanding of their need to trust Christ as Savior while in Sparks. The name Truth & Training (3rd through 6th grade) reflects the passion of Awana to teach third- through sixth-grade boys and girls the truth of God's Word and to train them to follow Christ in their daily lives. Our goal is that many of today's young people will become tomorrow's church leaders. T&T is the program that trains the leaders of tomorrow - today.